So over the Christmas New Year break I’ve had some time to do some searching and learning. It was a time where everyone was setting their intentions and words for 2018, read my response here, and I was busy learning about one word – Ask. Growing up I was told to help, make myself useful, don’t be a burden. So that’s what I did. The thing is that that doesn’t completely line up with running or growing a business. So I had to make a change. 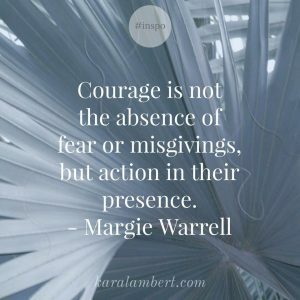 It was while I was reading the book Brave: 50 Everyday Acts of Courage to Thrive in Work, Love and Life * by Margie Warrell that I came across her chapter on Asking. 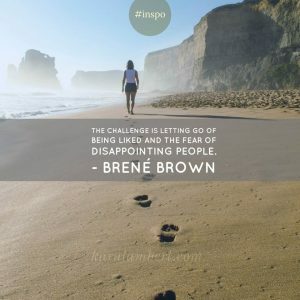 I’d just finished Braving the Wilderness: The Quest for True Belonging and the Courage to Stand Alone * by Brené Brown and so it was a good transition. But geez Louise did that chapter shake me. I was afraid to ask for what I wanted in business and as such I was playing safe and small. Sound familiar? The chapter (14 if you’re wondering) Margie’s book talks about asking for what you want and Brené writes about being vulnerable. And that’s the hang up. Other than the years of programming. That’s the issue, to ask we must be vulnerable. So often we don’t ask for fear of rejection. So instead we say no for the person. But it’s not just asking for the sale that I’ve being working on. Here’s the thing. The first instance where I used this, I put out a post asking for people to opt in to my freebie. But I did it differently, I told them the things I wanted for them. I asked if that is what they wanted. I asked them to join me to receive it. That was a powerful post. In fact, in the week that it remained active, meaning it was still getting responses, I had 120 people sign up in under 24 hours and this was in a busy Facebook group of 26 000 members. This was without any paid traffic. I was blown away. In fact I went on to gain 170 sign ups, just because I told them what I wanted for them and I asked them to join me. I learnt that by asking for what I wanted for them, I showed them that I had listened, I cared, and I was not afraid to say it. I admit, this one was harder. I don’t follow up. I find it icky. If I don’t hear from someone, I assume that they didn’t like my offer and so I don’t follow up. I don’t ask. So this is slightly different from asking for the sale, you’ve already done that. This is a check in after. I used to feel that I was being a pest or a bother, I mean let’s face it if they’d liked my offer they would have taken me up there and then. Right? Wrong! Why do you think that their a programs and businesses that follow you up when you click away from a website when you’re checking out. It’s not always that you got cold feet or a change of heart. Sometimes you just get distracted, life happens, and you never get back to it. Sometimes, you need that ‘remember me’ poke to get you back on track. So I’ve been asking. I’ve been listening. I’ve been using my courage. I’ve been quietening the voice in my head that says, “they didn’t really want you”. But more importantly, I’ve been realising how pointless not asking has been, because more often than not that fear was wrong and all I had to was ask because the people were waiting.